SAN DIEGO — The California Coastal Commission approved the construction of a hotel on the San Diego Bay waterfront four months after the Board of Port Commissioners consented to the project’s conceptual design. In February, the California Coastal Commission unanimously approved the Lane Field North Hotel Project, which received support from several speakers. Letters of support were received from San Diego City Council member Kevin Faulconer, the San Diego Tourism Authority, the San Diego Residents Group, the San Diego Port Tenants Association and others. The design, by LPP Lane Field LLC, will include a 400-room dual-branded hotel in a single tower where the Pacific Coast Padres ballpark once stood. Located at Broadway and Pacific Highway, the $120 million project is part of the plan to redevelop of the North Embarcadero. Scheduled to be constructed in two phases, the first phase includes a 250-room hotel comparable to a Hilton Garden Inn and an extended-stay 150-room hotel comparable to a Homewood Suites, according to the port. The two hotels would share common elevators, but have separate lobbies. The plan also calls for a rooftop café, a swimming pool and a deck that faces San Diego Bay. Construction is scheduled to begin Aug. 1 and end March 31, 2015, subject to closing financing, said Shaun Sumner, port area manager for the North Embarcadero Real Estate Department. Sumner anticipates the hotel will open its doors to guests April 1, 2015 contingent on construction starting this year by Aug. 1. 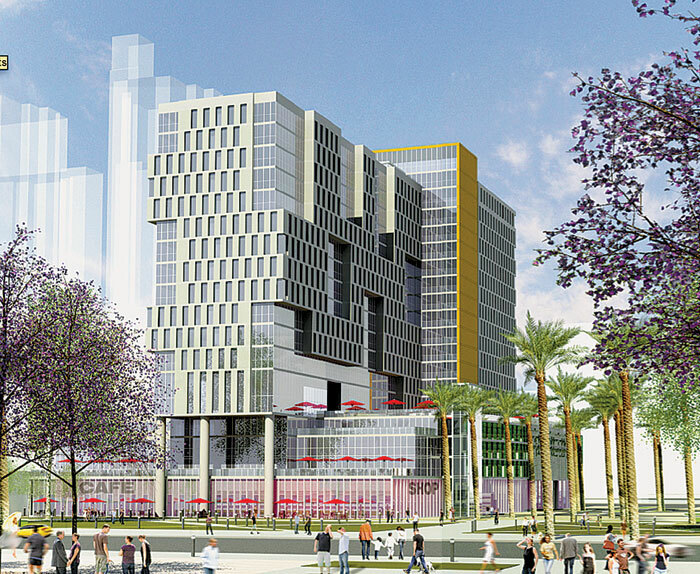 The second phase of the project would sit on the south part of the 5.7-acre parcel and would include a 400-room hotel. Project manager Jerry Trammer and the project’s developers were required to redesign the plan to include a 150-foot wide setback park, after environmentalists demanded the open space. The plan now calls for a 1.7.-acre park that will include areas of open space for the pubic, with a small food pavilion, recreational spaces and pedestrian paths. The park is attached to the $28 million North Visionary Plan, which is currently in its first phase of construction.